This article is about the genus of flowers. For Hyacinth, the Greek hero whose blood became the Hyacinth plant, see Hyacinth (mythology). "Hyacinthus" redirects here. For other uses, see Hyacinthus (disambiguation). Hyacinthus is a small genus of bulbous, fragrant flowering plants in the family Asparagaceae, subfamily Scilloideae. These are commonly called hyacinths /ˈhaɪəsɪnθs/. The genus is native to the eastern Mediterranean (from the south of Turkey through to northern part of the region of Palestine). Several species of Brodiea, Scilla, and other plants that were formerly classified in the lily family and have flower clusters borne along the stalk also have common names with the word "hyacinth" in them. Hyacinths should also not be confused with the genus Muscari, which are commonly known as grape hyacinths. Hyacinthus grows from bulbs, each producing around four to six linear leaves and one to three spikes or racemes of flowers. In the wild species, the flowers are widely spaced with as few as two per raceme in H. litwinovii and typically six to eight in H. orientalis, which grows to a height of 15–20 cm (6–8 in). Cultivars of H. orientalis have much denser flower spikes and are generally more robust. The genus name Hyacinthus was attributed to Joseph Pitton de Tournefort when used by Carl Linnaeus in 1753. It is derived from a Greek name used for a plant by Homer, ὑάκινθος (hyákinthos), the flowers supposedly having grown up from the blood of a youth of this name accidentally killed by the god Apollo. (The original wild plant known as hyakinthos to Homer has been identified with Scilla bifolia, among other possibilities.) Linnaeus defined the genus Hyacinthus widely to include species now placed in other genera of the subfamily Scilloideae, such as Muscari (e.g. his Hyacinthus botryoides) and Hyacinthoides (e.g. his Hyacinthus non-scriptus). Hyacinthus was formerly the type genus of the separate family Hyacinthaceae; prior to that the genus was placed in the lily family Liliaceae. Some authorities place H. litwonovii and H. transcaspicus in the related genus Hyacinthella, which would make Hyacinthus a monotypic genus. The genus Hyacinthus is considered native to the eastern Mediterranean, including Turkey, Turkmenistan, Iran, Iraq, Lebanon, Syria and the Palestine region. It is widely naturalized elsewhere, including Europe (the Netherlands, France, Sardinia, Italy, Sicily, Croatia, Serbia, Montenegro, Macedonia, Albania, Greece and Cyprus), Korea, North America (United States and Canada) and central Mexico, Cuba and Haiti. The Dutch, or common hyacinth of house and garden culture (H. orientalis, native to southwest Asia) was so popular in the 18th century that over 2,000 cultivars were grown in the Netherlands, its chief commercial producer. This hyacinth has a single dense spike of fragrant flowers in shades of red, blue, white, orange, pink, violet or yellow. A form of the common hyacinth is the less hardy and smaller blue- or white-petalled Roman hyacinth of florists. These flowers need indirect sunlight and should be watered moderately. Hyacinth bulbs are poisonous; they contain oxalic acid. Handling hyacinth bulbs can cause mild skin irritation. Protective gloves are recommended. Some members of the Scilloideae sub-family of plants are commonly called hyacinths but are not members of the Hyacinthus genus and are edible; one example is the tassel hyacinth, which forms part of the cuisine of some Mediterranean countries. Hyacinths are often associated with spring and rebirth. The hyacinth flower is used in the Haft-Seen table setting for the Persian New Year celebration, Nowruz, held at the Spring Equinox. The Persian word for hyacinth is سنبل (sonbol). The hyacinth appears in the first section of T.S. Eliot's The Waste Land during a conversation between the narrator and the "hyacinth girl" that takes place in the spring. In Roman Catholic tradition, the hyacinth represents prudence, constancy, desire of heaven and peace of mind; and is derived from the story of Hyacinthus, upon whose death the flower sprung forth. Wikimedia Commons has media related to Hyacinthus orientalis. 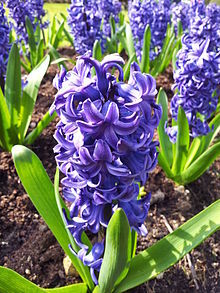 The color of the blue flower hyacinth plant varies between 'mid-blue' = violet blue and bluish purple. Within this range can be found Persenche, which is an American color name (probably from French), for a hyacinth hue. The color analysis of Persenche is 73% ultramarine, 9% red and 18% white. Tekhelet - meaning "turquoise" or "blue" in Hebrew was translated as hyakinthos (Greek: ὑακίνθος, "hyacinth"). ^ Stevens, P.F. "Angiosperm Phylogeny Website: Asparagales: Scilloideae". Mobot.org. Retrieved 7 November 2017. ^ a b c "Hyacinthus". World Checklist of Selected Plant Families. Royal Botanic Gardens, Kew. Retrieved 2016-10-28. ^ Beckett, K., ed. (1993), Encyclopaedia of Alpines : Volume 1 (A–K), Pershore, UK: AGS Publications, ISBN 978-0-900048-61-6 pp. 656–657. ^ "The Waste Land by T. S. Eliot". Poetry Foundation. Poetry Foundation. 2018-09-05. Retrieved 2018-09-05. ^ "Signs and Symbols". catholictradition.org. Retrieved 2019-01-22. ^ "(M)". Archived from the original on 2015-09-17. Retrieved 2015-09-24. ^ Funk & Wagnell's New Standard Dictionary (1942), under spectrum color list. Coccoris, Patricia (2012) The Curious History of the Bulb Vase. Published by Cortex Design.